We give a randomized 2n+o(n)-time and space algorithm for solving the Shortest Vector Problem (SVP) on n-dimensional Euclidean lattices. This improves on the previous fastest algorithm: the deterministic eO (4n)-time and eO(2n)-space algorithm of Micciancio and Voulgaris (STOC 2010, SIAM J. Comp. 2013). 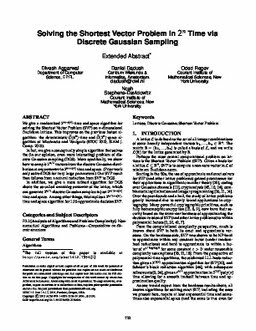 In fact, we give a conceptually simple algorithm that solves the (in our opinion, even more interesting) problem of discrete Gaussian sampling (DGS). More specifically, we show how to sample 2n/2 vectors from the discrete Gaussian distribution at any parameter in 2n+o(n) time and space. (Prior work only solved DGS for very large parameters.) Our SVP result then follows from a natural reduction from SVP to DGS. In addition, we give a more refined algorithm for DGS above the so-called smoothing parameter of the lattice, which can generate 2n/2 discrete Gaussian samples in just 2n/2+o(n) time and space. Among other things, this implies a 2n/2+o(n)- time and space algorithm for 1.93-approximate decision SVP.